Youth Rock Concert. Wednesday, MAY 1, with Live music from 6 - 8PM at Kianti’s. Come & enjoy the atmosphere, food & drinks! Five youth rock bands will be performing: Full Disclosure, TOAST, Faceplant, Diamond Wire, Common Cents & Space Monkeys. Free entry. 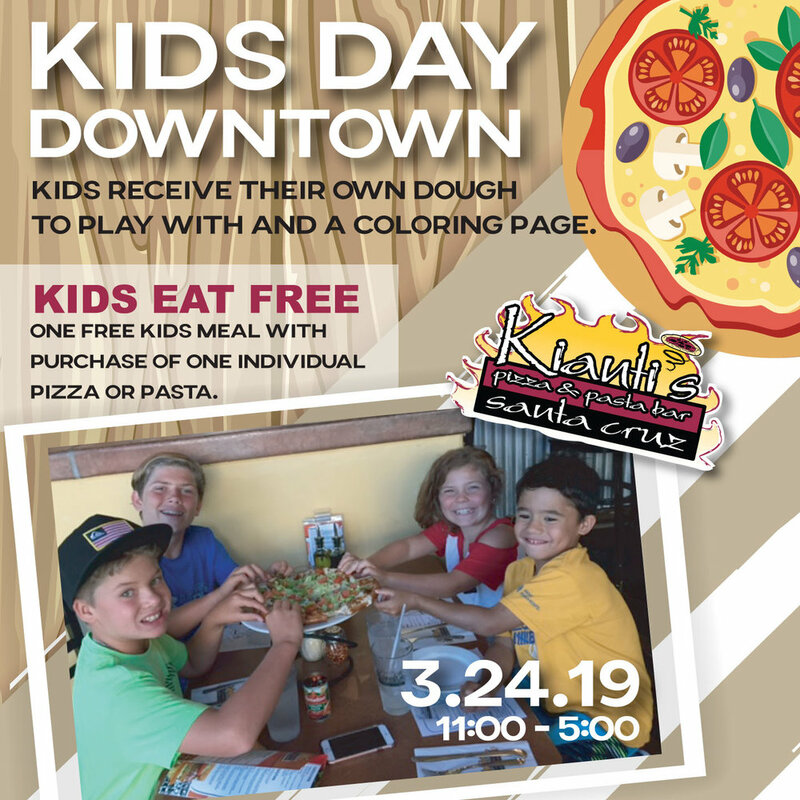 Join us at Kianti's from 11-5 on 3/24/19 to celebrate the Downtown Kids Day. Kianti's will be offereing KIDS EAT FREE. (One free kids meal with the purchase of one individual pizza or pasta). Kids receive their own dough to play with and a coloring page. $2 off green beer. $2 off any green pizza or pasta. 3/17/19 All day. Dine in only. 3/4/19 from 5-9pm at Kianti's. 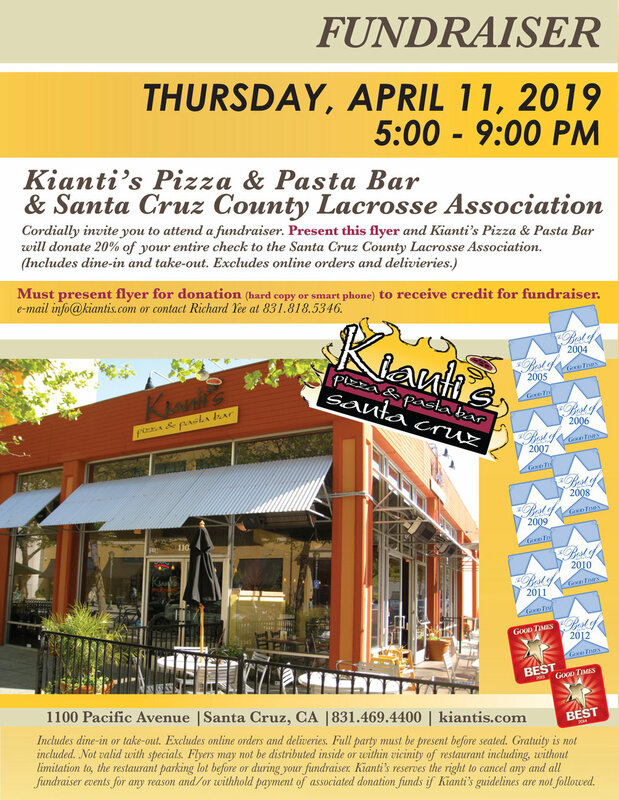 Kianti's Pizza & Pasta Bar & CYT Santa Cruz cordially invite you to attend a fundraiser. The cast from the upcoming CYT production Into The Woods will be performing throughout the evening. Present this flyer and Kianti's Pizza & Pasta Bar will donate 20% of your entire check to CYT Santa Cruz. (Dine in and take out). Must present flyer for donation (hard copy or smart phone). 2/28/19 from 5-9pm at Kianti's. Kianti's Pizza & Pasta Bar & Baymonte Christian School's Parent Teacher Fellowship cordially invite you to attend a fundraiser. Present this flyer and Kianti's Pizza & Pasta Bar will donate 20% of your entire check to Baymonte Christian School's Parent Teacher Fellowship. (Dine in and take out). Must present flyer for donation (hard copy or smart phone). For a limited time enjoy our Bacon Cheeseburger PIzza! February 19 - 28. Wine & Dinner For Two for $20 per person. Your choice of wine OR dessert. Your choice of salad and pasta OR pizza. Our favorite items are on the menu. 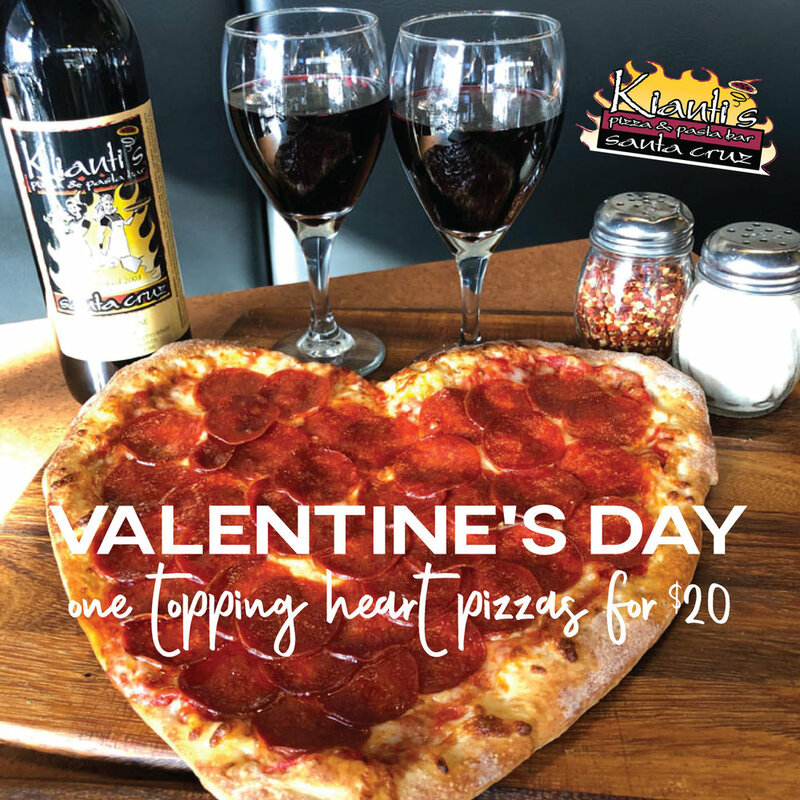 Kianti’s Valentine’s Day Special: One Topping Heart Shape Pizza for $20. All day. Kianti's Pizza & Pasta Bar & Community Aid and Resources cordially invite you to attend a fundraiser. Present this flyer and Kianti's Pizza & Pasta Bar will donate 20% of your entire check to Community Aid and Resources. (Dine in and take out). Must present flyer for donation (hard copy or smart phone). 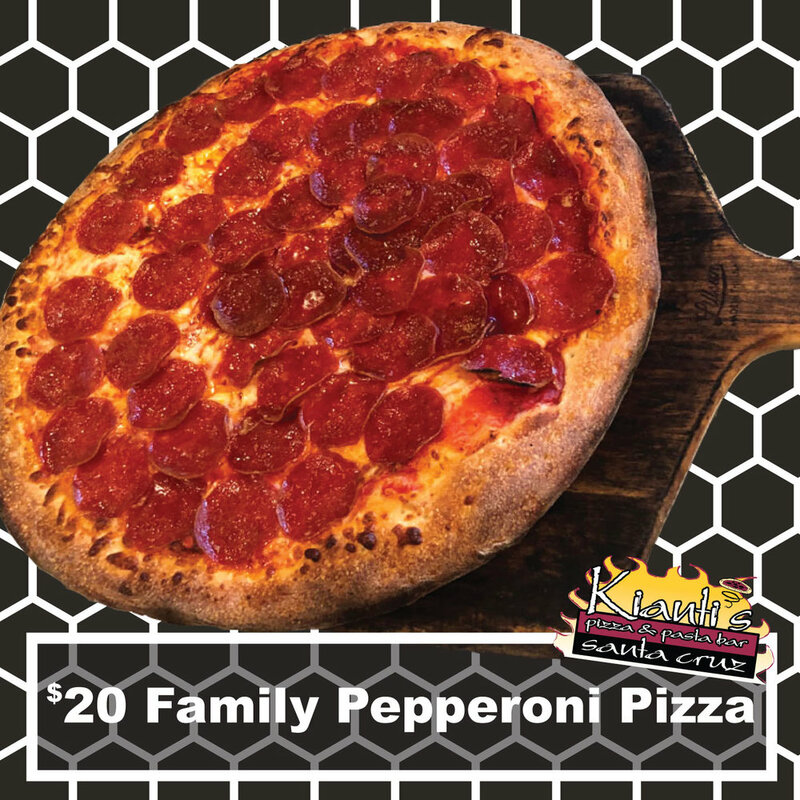 $20 Family Pepperoni Pizza in celebration of National Pizza Day. 2/9/19 11am - 10pm for dine in and take out. In celebration of National Pizza Day. 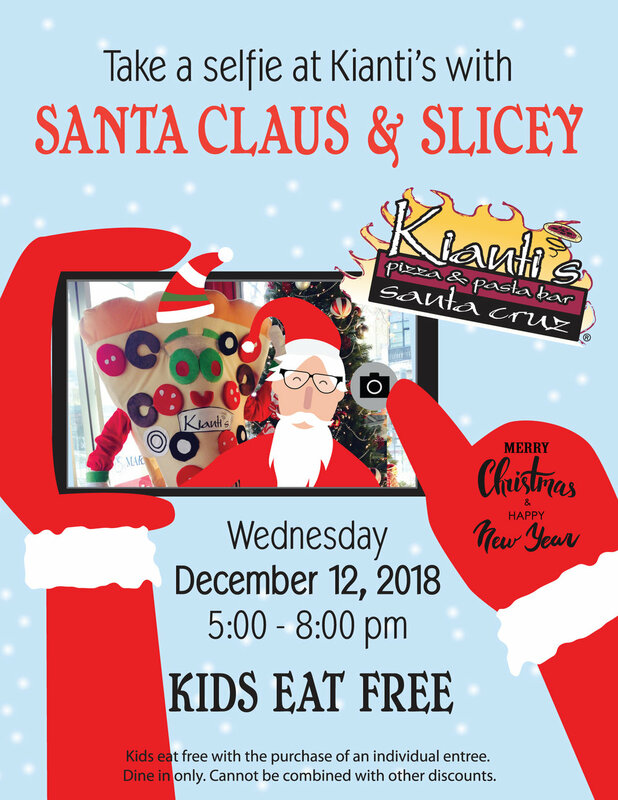 Take a selfie at Kianti’s with Santa Claus & Slicey on Wednesday, December 12, 2018 from 5:00 - 8:00 pm. Kids eat free. Kianti’s will be offering our Peppermint Santa Shot for $5. The Downtown Santa Cruise is a 21 and over event. Get a crew together and come hunt, scavenge and sleuth your way to a great after party! Kianti’s brings “The Nightmare Before Christmas” to life. We assure you our show will be full of Halloween frights and Christmas delights. Holiday performances every Friday and Saturday night from Thanksgiving to the New Year. Show times approximately 6:00 & 8:00 pm (times do vary). Donate an unwrapped toy for toys for tots and receive a free appetizer from Kianti's. Kianti's Pizza & Pasta Bar & DeLaveaga Elementary School cordially invite you to attend a fundraiser. Present this flyer and Kianti's Pizza & Pasta Bar will donate 20% of your entire check to DeLaveaga Elementary School. (Dine in and take out). Must present flyer for donation (hard copy or smart phone). 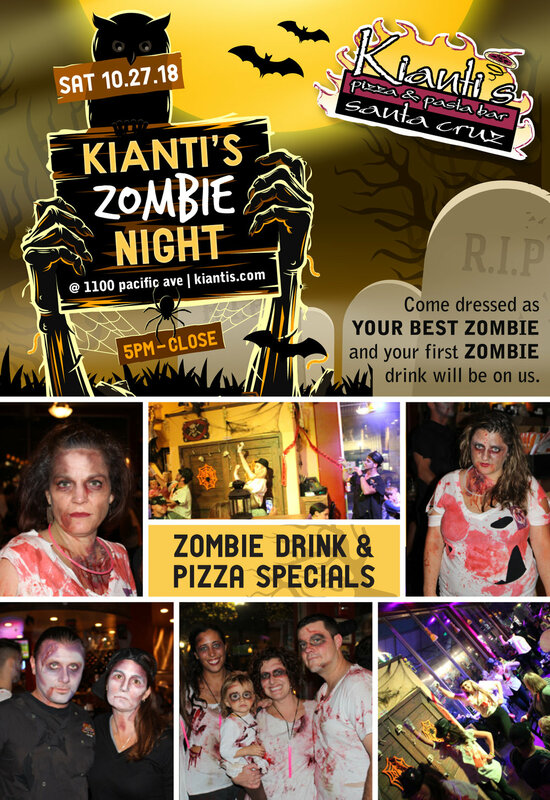 Kianti's Zombie Night 10/27/18 from 5-9pm. Zombie food & drink specials. Come dressed as your BEST ZOMBIE and your first ZOMBIE drink is on us! Stay and watch our ZOMBIE performance. Kianti's Thriller / Go Crazy Dance debuts Friday, 10/12/18. One of our most upbeat and fun shows of the year and fits in with that Halloween feel! Watch us as we perform a version of "Thriller" and "Go Crazy" by our pizza spinners and dancing staff. The performance takes place twice after 6:00 pm. Runs fro 10/12/18 through the Thanksgiving weekend. Don't miss it.